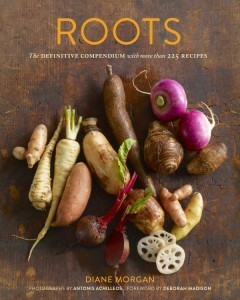 I’ve been browsing through Roots: The Definitive Compendium with an eye out for anything else we may want to add to our already long list of root vegetables going into the Derwood Demo Garden this year. I’m also intrigued by many of the recipes. The book provides a pretty exhaustive list of roots, some of which are easy to find by shopping and some near impossible, and some of which can be grown here in central Maryland with varying amounts of zone-stretching. It’s not a gardening book by any means, but it’s a starting point. Things I may try: taro and malanga, both of which should be easy to find at an international supermarket. I’ll need to sprout both of them indoors ahead of the growing season to have a chance at getting tubers to form. If they don’t, we’ll at least have handsome elephant ears here and there. Things I am not going to try: jicama, because 1) it requires a long growing season and I have limited patience for that sort of thing (see above and below), 2) it produces a large vine that I’d need to find space for in the garden, 3) the vine and its leaves and pods (jicama is a legume) are poisonous, and we have children wandering through the garden. Also, alas, not trying for wasabi, because it is a slow-growing perennial not hardy in this climate. It looks quite lovely, though. Also not burdock. Just because. Maybe next year. Things I am tempted by: crosnes. Things on the unusual side that we are growing: yacon, again, because it is so impressive and popular and tasty. (In regard to the linked post: also dahlias, and I may eat some of them again, if I don’t like the color.) 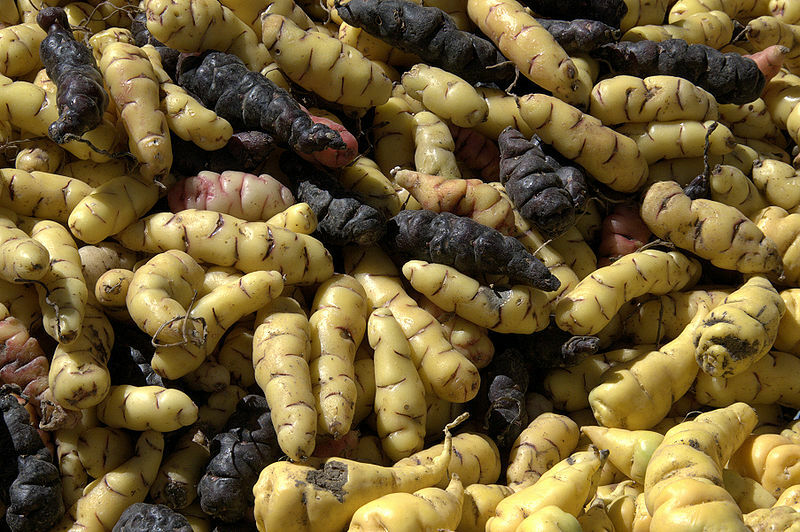 Also (for the first time) oca: yet another plant requiring a long growing season to produce, but I’m going to give it a try. The somewhat more prosaic list of other roots we’re growing follows. Alliums including leeks, bulbing onions (Superstar and Candy Red), bunching onions, and cipollini onions (in the salad table!). In the fall we’ll put in garlic, gray shallots and potato onions. Beets of various kinds and colors, including lots and lots of my favorite red-leafed Bull’s Blood. Turnips of at least three kinds, and rutabaga in the fall. Radishes: the Easter Egg mixture in the salad table, plus White Icicle, plenty of daikons, Red Meat (a “watermelon” type), and probably some others too. Carrots in a range of colors, and little round Parisian carrots in the salad table. Potatoes (Yukon Gold, Eva, and Adirondack Red) and sweet potatoes (Georgia Jet, plus maybe one All Purple). We already have plenty of Jerusalem artichokes (although, thanks to valiant efforts, far fewer than we did have). And I don’t think we’ll be starting another horseradish patch this year: it was hard enough to eradicate last time, even though the harlequin bugs did their best to help. But I think this is enough to be going on with!